Everyone always talks about leadership, what is it, are we born leaders or can we develop into leaders? As someone who feels like I haven’t been born as a natural leader, I was curious to read about what it takes to be a leader. Is there a certain formula you have to follow? Why are some people deemed leaders and others are not? And what does it take to get identified as a leader? In the beginning of reading the book The 21 Irrefutable Laws of Leadership by John C. Maxwell, he covers The Law of Process which focuses on how leadership is something that develops daily, not in a day. He compares leadership to investing. It’s something that will compound over time, and not like investing successfully in the stock market and making a fortune in a day. What matters most is what you do day by day versus over the long haul. “The secret of our success is found in our daily agenda.” He asks, “What can you see when you look at a person’s daily agenda? Priorities, passion, abilities, relationships, attitude, personal disciplines, vision, and influence. You can see who a person is becoming by looking at what they are doing every day, day after day. To be a successful leader you must first be a learner. The learning process is ongoing, requires self-discipline, and perseverance. You should have the goal each day to get a little better, building progress on each previous day. Every person’s leadership growth process is different. Whether you possess natural ability to lead or not, there are five phases that can assist you in the process of developing leadership. Phase 1: I Don’t Know What I Don’t Know. As long as a person doesn’t know what he or she doesn’t know, there is no room to grow. Most people fail to recognize the value of leadership and essentially leadership is the ability to influence. In the course of each day, we usually try to influence at least four people. Don’t focus on that fact that “you don’t see yourself as a leader” but instead remain curious with all there is to learn. Ever found yourself in a group project or leadership role only to realize that no one is following you? Being put in charge is not the same as being a leader, we must learn how to lead. Former British prime minister once said, “To be conscious that you are ignorant of the facts is a great step to knowledge.” We must understand that knowledge is required to go forward. The moment you realize that leadership is what is going to make you successful in your professional career, you can work to develop the skills necessary to succeed. When having breakfast with a colleague, Maxwell was asked: “what is your plan for personal growth.” Fumbling for an answer, he later admitted that he didn’t have one. From that day on, he made it a practice to read books, listen to tapes, and attend conferences on leadership. Not only will daily practice help you grow in a professional career, but your personal life as well. Once you have recognized your lack of skill in the previous steps and begin the daily discipline of personal growth, alignments will begin to take place. When teaching a leadership workshop, Maxwell noticed a particularly eager student. When he got to the part of the workshop where he taught the Law of Process, he asked the student to stand up so he could talk to him. He finishes by emphasizing that in order to be a great leader it won’t happen in a day and you must start paying the price now. Start devoting your days to developing leadership to later experience the effects of the Law of Process. When you reach phase five, your ability to lead almost becomes automatic. In this stage, your instincts will nearly be automatic with an incredible payoff. What we must remember as students is that leadership is something that is developed daily, not in a day. Leadership is a process which encourages development, matures and changes people. This process requires time, patience, and effort. The Law of Process requires diligence and patience as it is our daily efforts which will develop us as leaders. Going into my Junior year of college, I was feeling rather content with where I was at starting a new job at Career and Internship Services as well as taking on a leadership role as the Volunteer Coordinator for UMD’s yoga club. During Junior year everything starts to become a little more real and intense. Running for a leadership position in my sorority, Phi Sigma Sigma was not something on the top of my priority list, but it was something that was fun and exciting to consider. As the applications were sent out, I started to think a little more seriously, “what position would I run for?”, and “could I really pull this off?” I personally have never held a high position in an organization let alone an executive board position of a chapter with 100+ women. One of the main reasons I was so hesitant to running for a position is because I didn’t feel like I would be a good leader because I am introverted. What I needed to learn is that there is already a misunderstanding that introverts are shy, when actually we are great listeners, which is fitting for leadership roles. For the longest time, I did not know or understand my own strengths. This is where I used my results from the CliftonStrengths for Students to my advantage. Everybody has their own strengths and in this process, I realized it was about time I stopped doubting myself. Ask yourself “would I be a good fit?” Now change the question to ask “why would I be a good fit?” to understand from a different perspective. The most important thing is to run for a position that aligns with you in which you could passionately contribute to your organization. If you find yourself wanting to run for a leadership position but feel hesitant, that is natural! What do you have to lose? Take the time to understand what would make you a strong leader because chances are the answers are already there. With graduation around the corner, it’s crazy to see so many years go by with a blink of an eye and detach myself from the college environment. It’s a scary, yet exciting thought, and deep down, I know I’ll truly miss college and the opportunities that come with it. One aspect I know I will for sure miss once I leave the college bubble is campus involvement and holding leadership roles. Before giving a preview on today’s post, I just wanted to put this out there that the title is intentional. Since we’re all so familiar with the “taking up the mantle” idiom, I figured I would throw in a twist by titling this post, “hanging up the mantle” which essentially is supposed to represent stepping down as a leader. (Clever, I know!) With that being said, in today’s post, I will be focusing on my experiences of stepping down from leadership roles and what are ways and questions a student can ease the transition of going from super-duper involved on-campus to the “boring, dull” lifestyle in the real-world. Well then, let’s dive in! From personal experience, I think one of the most difficult aspects of being a leader is not the stress that comes with leading nor is it the backlash and criticism you get from people, but rather the moment when you realize it’s time to step down. The moment when you realize that your dreams, goals, and vision as a leader will diminish is unsettling. (Okay, it’s not that extreme, there are successors for a reason!) On the contrary, I think some individuals may feel differently and fathom the relief that comes with stepping down more than anything, which is understandable too. From my own experience, this was especially relevant in my active membership with Asian Pacific American Association (APAA). I’m sure by now, you perhaps are aware of APAA from my previous blog posts. As an active member and previous board member, I recall there being moments where I wasn’t ready to let go and still wanted to be involved and contribute to the organization as best I could. Eventually, I realized the importance of letting go and restraining myself and ultimately how important it was to simply believe in the new generation of leaders with their ideas and beliefs in regards to taking care the organization. Granted, I was still involved with the organization, it’s just that getting involved looked a lot different. For any leader, really, it’s difficult when you’ve invested so much time and effort into an organization and literally have attached yourself to it whether it be mentally, emotionally, or spiritually. An important part of stepping down for me, I’ve realized, is that being a leader doesn’t always have to mean that you’re in the front line leading the charge. It can also mean staying behind and helping others rise to positions of leadership. As part of leaving the college bubble and launching into the real world, I know the best thing I can do as a leader with previous experience is to give back to the next generation of leaders. As my time of leading has come to an end, I’ve realized that part of stepping down is inspiring and guiding others to step up. I think any student who is or has been involved on campus and served in a leadership role knows that time flies by all too fast when having to balance, school, work, and extracurricular activities such as leadership positions. Especially for graduating seniors, this creates more issues as finding a job only creates more chaos. But what happens when a person goes from planning, studying, working, organizing, eating, sleeping, job-hunting, and exercising, to simply just working? I think this is a reality that many students face as the fluid nature of college switches to the routine-based lifestyle of working after graduation. Honestly, I, myself, have not gotten the chance to let the idea of graduation settle in due to the busy nature of college itself. With having conversations with career counselors and peers, I’ve only had the chance to ponder on it slightly, but the thought of going from busy to boring is quite depressing honestly. As I navigate these last few weeks of college before graduation, it’ll be smart for me to prepare the transition from college to the working world. Granted, I’ll still be doing summer research in the Twin Ports area, but I think preparing mentally and emotionally to slowly transition out of college will be a real challenge. Of course, I don’t have all the answers to ease the transition as I am still in the process of doing so, but I think it’s important for any college student to just be aware and mentally/emotionally prepared to leave college. But hey, there’s hope! Just because college is ending doesn’t necessarily mean that getting involved has to end as well. As young professionals stepping into the real world, the chance to get involved in the community is endless and the opportunity to network is even greater than what the college level has to offer. For instance, there are a number of organizations dedicated to serve and connect young professionals. On a local level, the Duluth Area Chamber of Commerce offers a number of opportunities for professionals both young and old. Additionally, if you have certain special interests and causes that you would like to advocate for, there are even more opportunities. Personally, I’ve been looking forward to getting involved with two different organizations after I graduate: Coalition of Asian American Leaders & National Association of Asian American Professionals. Ultimately, I see college as a unique stepping stone for students to get active in their communities. If student leaders are able to translate the work that they’ve put it in at the university level into their communities afterward, just imagine the positive impact and change that can occur in the world. So where do we go from here with zero motivation to study, “senior slide” kicking in if it hasn’t already, and the struggles of going from college-life to the real world? Well, if I told you I have all the right answers, I would be lying. I think the important piece is to simply reflect on the time in college and enjoy the last few moments before it all ends. Furthermore, ask questions and have conversations with professionals and staff who work with students who go through this transition such as career counselors, advisors, etc. I know for myself, my supervisor, Ellen, has pushed me to seek out opportunities past the college bubble and to consider ways of still getting involved in the working world. For many, a lot of individuals are ready and can’t wait to fly off into the real world, and for the very few like myself, it’ll be a bittersweet ending leaving the college life and the opportunities and activities that came with it. Like I said before, if student leaders were able to make a great impact at the college level, imagine the potential for growth and positive change in the future once this effort is transferred to our communities whether that be on a local, regional, national, or international level. So what are you waiting for? Get out there and change the world (for the better, of course) graduates! The notion of leadership is one that is highly valued among many individuals. In addition, race and diversity is a topic that is consistently prevalent in our society. When blending the two, the two elements complement one another quite well. Recently in life, there has been many events relating to the two topics. Within this past month, I have had to plan for Asian Pacific American Association’s (APAA) Annual Culture Show, partake in various student of color panels, and discuss about cross-cultural communication. In addition, the recent events at the University of Missouri and Paris has definitely impacted me as an individual by urging me to reevaluate myself as an Asian Pacific American leader. Today’s blog post zooms in on the two notions of leadership and culture, Asian Pacific Islander Leadership: Beyond the Boat. Before starting, I want to take some time to talk about the “bamboo ceiling” phenomenon. The term “bamboo ceiling” derives from Jane Hyun’s book Breaking the Bamboo Ceiling: Career Strategies for Asians. To sum it up, the term refers to the barriers and limitations to Asian Pacific Americans to rise to leadership roles it. In regards to the historical context, before the modern days in Asia many people would built their homes out of straws, mud, and bamboo. Figuratively speaking, the “bamboo ceiling” is what limits Asian Pacific Americans in career success. Once the rooftop is sealed, an individual can only achieve so much, and therefore it often restricts one’s ability to reach their full potential. The term “fresh off the boat” is an older term for immigrants who are new to the United States who are freshly arriving off the boat (this was before air travel was a possibility). Altogether, we have the phrase, “fresh off the boat.” One thing to be aware of is that with race and culture there also comes many generalizations and stereotyping. The phrase “Beyond the Boat” is a way for individuals or a culture group to break these stereotypes and generalizations to overcome such judgements and expectations. Relating back to the topic of leadership, the image of Asian Pacific Americans in leadership roles is one that is barely visible. According to LEAP (Leadership Education for Asian Pacifics), “less than 3% of the leadership of the nation’s top for-profit and non-profit groups are Asian Pacific Americans.” With such a low percentage of role models, it’s difficult as an Asian Pacific American student to see a future past the “bamboo ceiling.” As an Asian American in today’s society, there is a lot of concern as to what leadership opportunities are available for myself and others in the future. To go “beyond the boat” requires me to constantly step outside my comfort zone and always having to put in the extra effort to be acknowledged. Furthermore, this phrase inspires me to break the stereotypes and generalizations revolving around Asian Pacific Americans and also to increase the 3% of APIAs in leadership roles. To conclude, the duty of being a leader is never an easy task to do. From any standpoint, there will always be some form of systematic oppression despite circumstances. As a student leader for APAA, I find it most difficult promoting such events and activities relating to the Asian Pacific culture and showing the common interest for those who may not identify with the culture itself. Furthermore, I find it difficult to motivate my fellow peers to embrace the trait of being a leader to increase the 3% due to the lack of APIA role models in society. As many millennials begin to enter leadership roles after college, it will be interesting to see how the percentage of leaders with a different ethnic background evolve throughout the years. As I had mentioned from the previous post I would highlight some basic characteristics of a leader. These traits are what I personally think make good leaders. Before we dive in, I think it’s really important that we talk about the “self” first. In general, if you want to help others you have first learn to help yourself first. This may apply for many different cases whether it’s supporting others or even loving a significant other, you have to start from within (yourself) and work towards the external (others). I think this is key because it’s very important that leaders know who they are and know what they want. Not only that, but also having a high self-esteem, sense of self-efficacy, moderate self-regulation, and the list goes on and on. Really, in the end the most effective leaders are those who are comfortable and have come to accept themselves as a whole. They are the ones who take out time daily to better improve themselves. Confidence is one of the most important traits a person can have in general, not just in leadership. Confidence is important because it breaks down the barriers and fears that tend to hold us back. I can sit here all day and talk about the importance of confidence, but that would be irrelevant. I stress the importance of confidence for leadership because I believe it is an essential quality for a leader to have. Self-confidence gets rid of most insecurities, fears, and negativity. With confidence, leaders are able to execute tasks more efficiently and create a stable environment. I can’t emphasize how important confidence is when it comes to leadership. This blog post (The Role Confidence Plays in Leadership) I found online does a great job of highlighting the connections between leadership and confidence. Check it out! It’s important for an effective leader to have great communication skills. It doesn’t matter if it’s public speaking, interpersonal communication, or simply expressing ideas. Communication is crucial when leading. I say this because there are two basic principles to communicating: talking and listening. Almost every second of being a leader requires talking. Whether you’re giving a speech or just getting to know your colleagues, it doesn’t matter. To branch off of that, it’s important that as a leader you practice your public speaking. In almost every leadership role you will have to, almost, always speak in public. It can range from giving a presentation, talking to your members for a meeting, or welcoming guests to an event. All of those require some degree of public speaking skills. To continue, as important as talking may be, I would have to say that listening is twice as important. It’s important that you listen to what people have to say and not just “hear” what they say. As a leader it’s important that you create a loyal and trusting environment for your followers. By talking, engaging, and listening to your followers you are able to create that environment yourself. Listening and meeting their needs is one of the most important tasks as a leader. To sum things up, I’m sharing two awesome blog posts from Forbes that talk about communicating and listening. Indeed very useful and I would highly recommend you to check it out. Communicating. Listening. 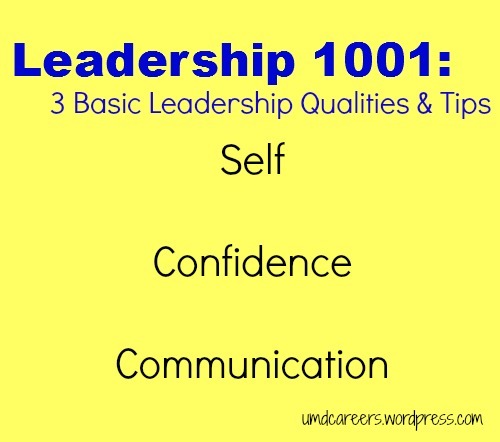 Now these are just three basic qualities and tips that I wanted to start with. From my experiences these are the three qualities that I have worked on most and have become quite familiar with. There are a zillion other characteristics and abilities that require you to be an effective leader, but you can only acquire so many. What makes leadership so awesome and fascinating is that every leader is different and they choose to have different qualities and abilities. As you start or continue your leadership journey I encourage you to consider the unique qualities and attributes you would like and acquire in order to become your own individual leader. In closing, I would like to share a quote that represents a leadership quality that I value.